Keep the carrier accessible: Many cats only see the carrier when it’s time to go somewhere, so they begin to feel anxious as soon as the carrier appears. 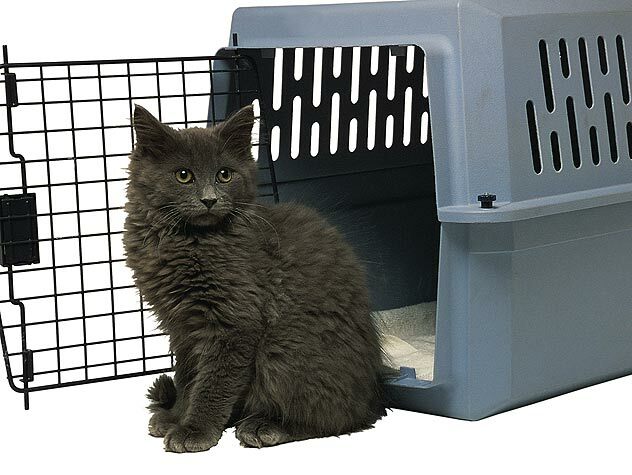 Instead, keep the carrier on the floor and open at all times so that your cat can come and go as he pleases and won’t see the carrier as a place where he gets trapped. Remember, be patient! Cats can be slow at adjusting to change, so it could take a few weeks to a month for your cat to even acknowledge that the carrier is there. Make the carrier a nice place to be: Place some comfy bedding in it and toss in a few treats, your cat’s favorite toys or some catnip when you first set it up. Replenish the supply every few days. Teach your cat the “in” command:Once he’s confident enough to go into the carrier to eat, start calling your cat over to it for a treat. Toss the treat in the carrier and when your cat goes in, say “in.” Praise him for as long as he’s in the carrier. When he comes out, toss in another treat and repeat.Over time, you can start saying “in” first and your cat should go into the carrier on his own — just be sure to give him a treat after he does and while he’s still in the carrier. You’ll be associating all your cat’s favorite things — playing, learning, treats and you! — with the carrier and showing him it’s not only safe, but fun. Practice closing the carrier door: Repeat the above process, but start closing the door and locking it before giving your cat a treat. Once he’s eaten the treat, open the door, let him come out and repeat. Gradually increase the amount of time the door stays shut. If your cat is calm while the door is shut, give him more treats. If he seems upset or tries to get out, do not give him a treat and try again with less time in the crate. Practice picking up the carrier: After your cat learns that a closed carrier door is okay, try picking up the carrier with him in it and putting it back down gently. Add this to your training routine. Practice walking with the carrier: Once you’re able to pick up the carrier with your cat remaining calm inside, take a few steps and then gently put the carrier back down, reward him and then let him out. Practice going outside with the carrier: You don’t have to go far — just outside your front door and back inside could be far enough at first. The key is to make sure your cat remains calm while you repeat this — you can gradually increase your distance and time over time. Walk around the block: Keep practicing until you’re able to walk all the way around the block with your cat calm in the carrier. Once you can do this, you’ll know your cat’s fear of the carrier has been conquered. Despite your best efforts, your cat may never enjoy being in his carrier, and that’s okay. “While the cat may not like the carrier, he or she should learn that it’s a safe place,” says Dr. Johnson. I’ve been practicing this routine for nearly three years with my cat Mojo, and the change has been dramatic. Before, she would disappear as soon as the carrier appeared. Now, she seeks out her carrier for naps, willingly climbing into and finding comfort in the small space. Does your cat resist going into a carrier? Get tips to help your feline accept this mode of transportation.